All creation join to say. Raise you joys and triumphs high. Sing ye heaven and earth reply. What a glorious day! When I think about all I have in Christ I am continually blown away by what I have been given, not because of anything I have done, I can take credit in no way for my salvation, I believe because God first chose me. How humbling is this truth. I this beautiful day, full of celebration and new birth I was inspired to create something new and delicious out of something old. I've had a bag of shredded zucchini floating around in my freezer since last summer. I keep meaning to do something with it, but I always say "next time". Well, not this time! I found a new zucchini muffin recipe, adjusted it for what I wanted, and finished off last years produce, finally! This was the perfect way to do it too. 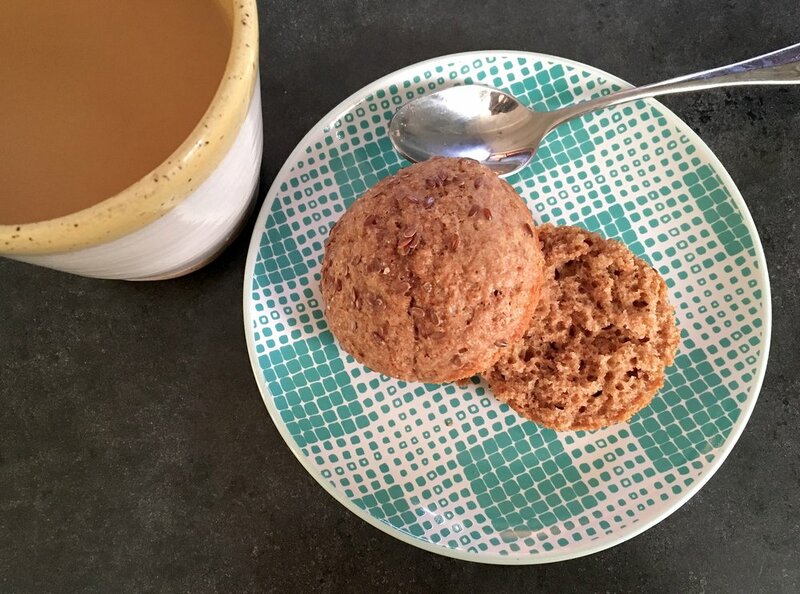 A light and healthy whole grain muffin, lightly sweetened and filled with one of my favorite treats; chocolate covered espresso beans!! When I saw this recipe I knew I had to make it. I didn't have a go-to zucchini muffin but this one looked promising, and I was right. It's just rich enough to make it special, but not too rich to make it feel overly indulgent. The original recipe calls for a streusel on top which would be marvelous, but I skipped it this time out of laziness, but did chop up a handful of dark chocolate espresso beans for pizzaz. And chocolate. Come on. The final product came out as beautiful as I had hoped. Flecked with green from the zucchini, and chocolate from the espresso beans. I added some espresso powder for a little extra mocha flavor, and probably could have added more (I think I'll try 1/2 teaspoon next time!). They turned out light and satisfying. A perfect zucchini muffin. Combine flour, sugar, baking soda, baking powder, salt and espresso powder in a bowl and set aside. In a separate bowl, whisk the egg and then add olive oil, milk, syrup and vanilla. Add this mixture to the dry ingredients. Add the zucchini, and stir until combined. Transfer the batter to the prepared muffin tin. Bake in preheated oven for 18-20 minutes. Remove from oven, wait a few minutes for the muffins to cool before removing them from the tin. It's that time of year again, zucchini season. The summer squash are exploding from every stand at the farmer's market, dark green, light green, yellow. Every year I hear people groaning about their excess of summer squash but to be honest I've never felt like I had too much of this mild vegetable. I honestly think I could eat grilled zucchini all day, every day of August. It is so good. A little olive oil, a pinch or two of salt, +/- some chili powder or smoked paprika, I never get tired of this simple preparation. And then there's summer squash's sweeter side, the magic of zucchini bread and muffins. 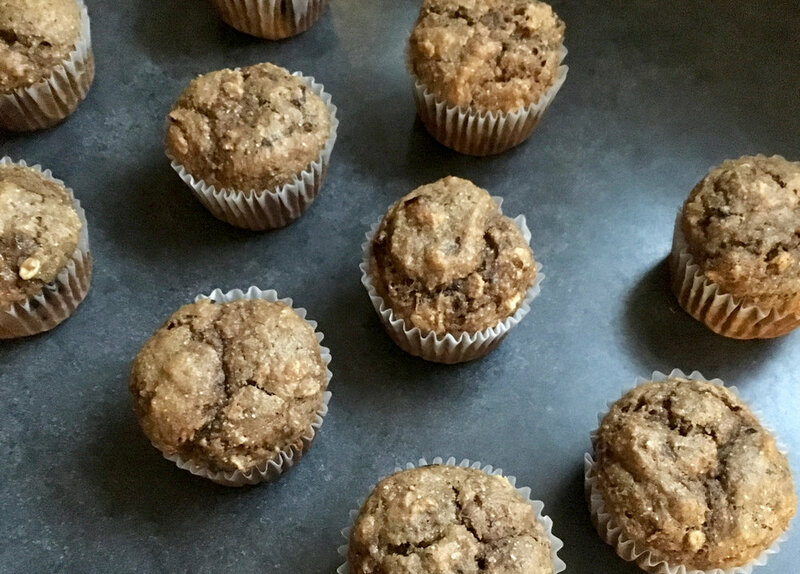 I whipped up these muffins last weekend to keep in my freezer all week, easy to pull out for a mid-morning snack or to tide me over in the late afternoon before dinner. They ended up being the perfect choice. Nothing flashy, mildly flavored, not overly sweet. A true snack. Each one is on the smaller side, good for a quick bite when you need something fast! 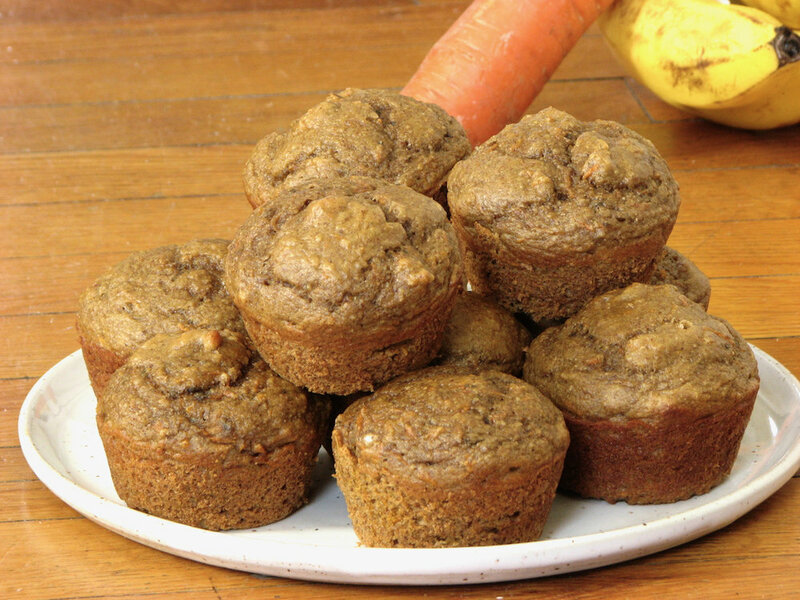 These muffins are full of wholesome ingredients, the zucchini obviously, whole grain oats, whole wheat flour, and Greek yogurt. Naturally sweetened for the most part with a little honey (plus just a bit of brown sugar), and lightly spiced with cinnamon. They may not win any beauty contests, but they will give you something tasty and nutritions to sink your teeth into when that craving strikes. Preheat your oven to 350F (176C) and prepare a muffin pan by lining the cavities with paper liners or greasing them with oil or cooking spray. Set aside. In a large mixing bowl, combine the flour, oats, cinnamon, baking powder, baking soda, and salt. Set aside. In a separate bowl, beat the egg until it becomes slightly frothy. Whisk in the yogurt, honey, sugar, and vanilla, mixing until well combined. Fold in the shredded zucchini. Add the wet ingredients to the dry ingredients, mixing gently until just combined. Fold in the chocolate chips, if using. Divide the batter evenly among the 12 muffin cups, filling them almost to the top.